Founders Captain Charles Buckner and his very scrappy First Mate, Dr Diane Pennica (inventor of Genentech’s Heart Attack and Stroke drug t-PA, have together launched Siren Song California, a Community Outreach Program in Southern California. Visit their website at http://sirensongca.org/. Siren Song California’s mission is to leverage the extensive boating network in Southern California to provide a free day of sailing on the ocean (Sound Life Event) to health-challenged individuals, their families and caregivers, and youth development organizations (Siren Song’s VIPs). Sponsors help provide the boats and meals needed for the VIP Sound Life events. VIP organizations include Southern California hospitals, veterans groups, human services and local youth development groups. Sound Life Events are scheduled to start in April, 2017, and support VIPs from Olive Crest olivecrest.org and the Marine Corps League – Southcoast Detachment. 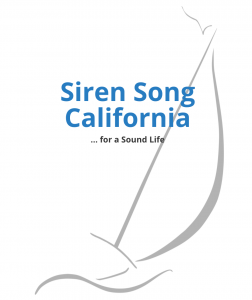 The First Annual Siren Song Regatta will be held off Dana Point Harbor, with four VIP Sound Life Boats included in the race, followed by a VIP awards/recognition ceremony and dinner for all racers and Siren Song sponsors at the Dana Point Yacht Club. Additional Sound Life events are being scheduled throughout the year. These events will culminate with a Year-In-Review Banquet to share VIPs’ experiences and highlight planned events for the coming year. The banquet will include the Founder’s Award presentation to recognize Siren Song’s most active and generous contributor(s). Posted in Firends of Scrappy Women, Life Experience, Non-profit and tagged healing, non-profit, Sailing, Veterans, Yacht Club. I’ve personally experienced the beauty of this coastline and the warm hospitality offered by Diane and Charles. I hope you will support this worthy cause!